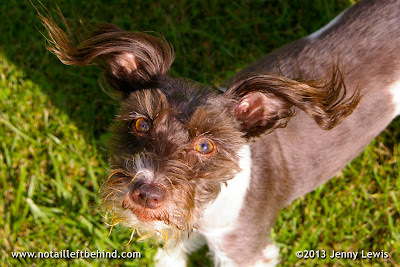 Don't ever let anyone dissuade you, every dog deserves a tail and natural ears. No matter what excuse or reason that is given for docking or cropping, it is not valid. Seriously. I have read and heard every excuse imaginable and I can refute every single one with clear and sound logic & reality based facts. The truth is, docking is done for cosmetic "aesthetics" and to maintain an overly obsolete "breed standard" for certain breeds. 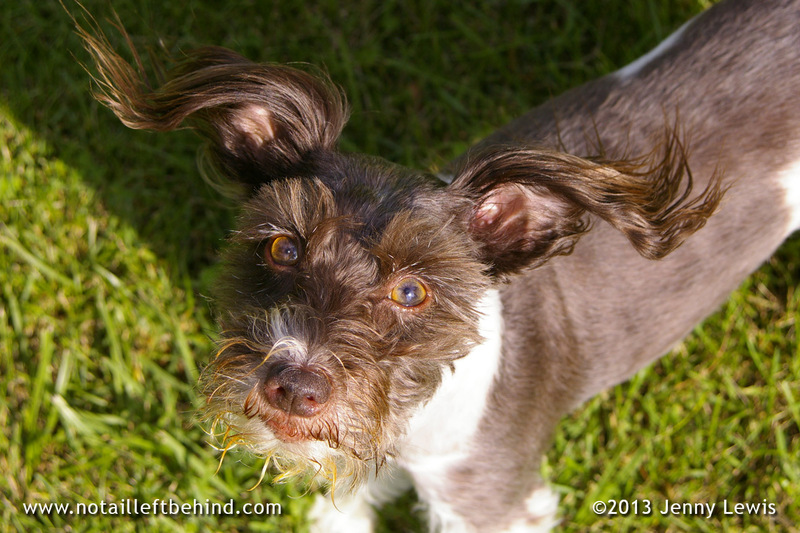 In this photo you can see sweet Pixel's gorgeous ears blowing in the breeze. 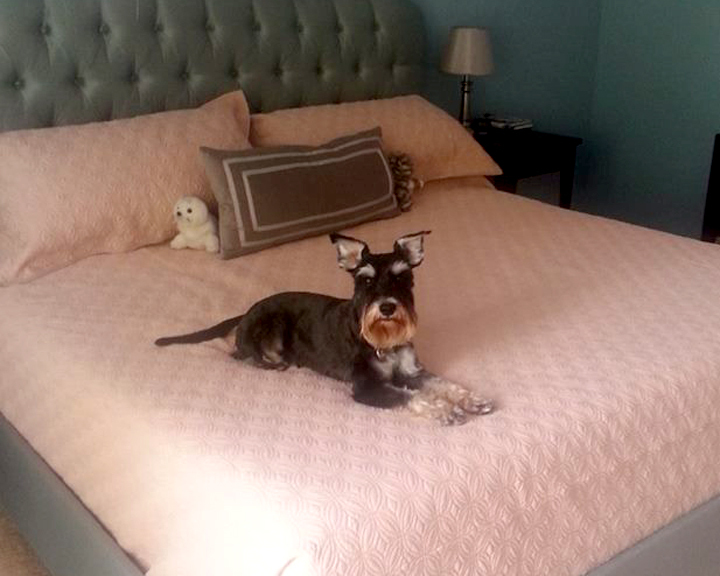 A supporter of our campaign, and advocate for dogs having their tails, recently shared these photos on our "No Tail Left Behind" Facebook page of her gorgeous miniature schnauzer Louie, which is the breed my sweet Pixel is, and his long, beautiful tail and natural ears. Louie's tail looks perfect on him, he looks whole. He looks complete...and he uses it for everything. Jennifer Blazewick, his mother, says that Louie communicates with her all the time using his tail. He points, shows love, uncertainty, danger, playfulness...all sorts of emotions he shows with his tail. All dogs deserve to communicate with their tail. In stark comparison, look at the end of my sweet Pixel's back. There is a nub, a missing tail, and no way for her to communicate fully what she is feeling via her tail. Many times, when filled with excitement and joy, when normal impulses get sent through her body and into her tail....those impulses hit a brick wall, or rather a nerve bundle and some scar tissue. She can't do all the things that dogs with tails can do...and it's not fair. She's beautiful, she's brilliant, but she is not whole. 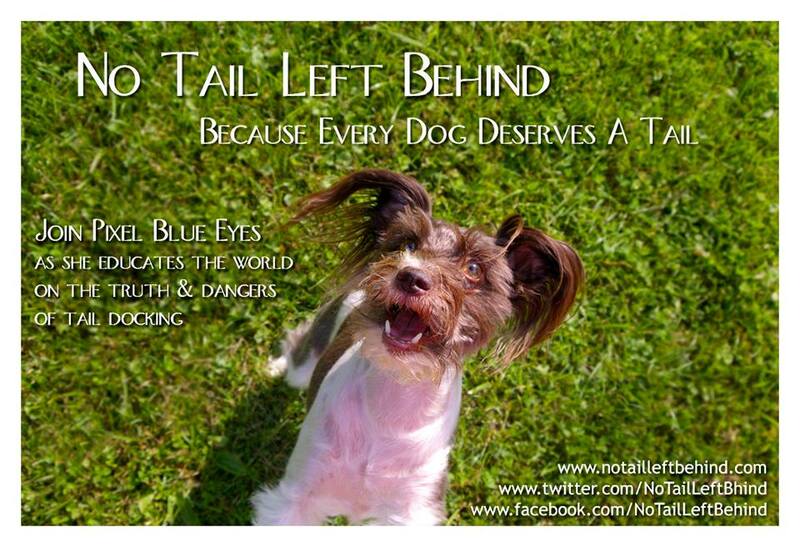 Look at Louie and look at Pixel...why are so many dogs denied their right to a tail? 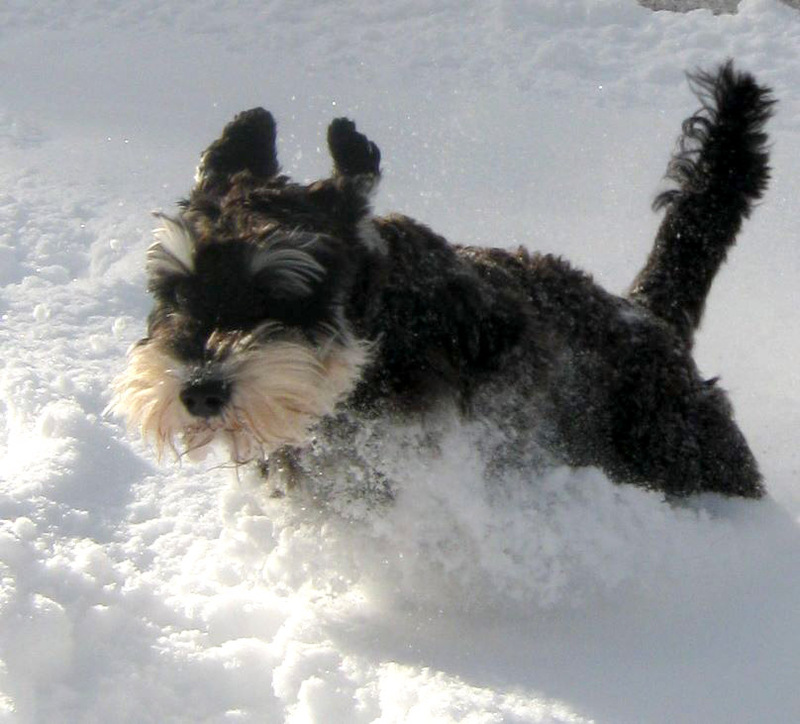 In this photo of Louie running in the snow, you can see he has it up and is using it for balance as he runs through the snow. Pixel and I have several friends in Europe and Australia that are Schnauzers & Schnauzer Mommies. They ALL have their tails and it's as right as rain, as natural as can be, and I love seeing their beautiful tails wagging with sheer joy. 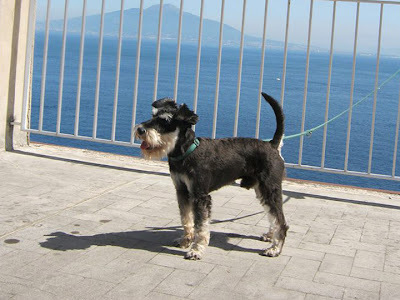 The miniature Schnauzer is just one of many dog breeds whose tails are taken from them as a puppy, denied this vital tool for their entire lives. 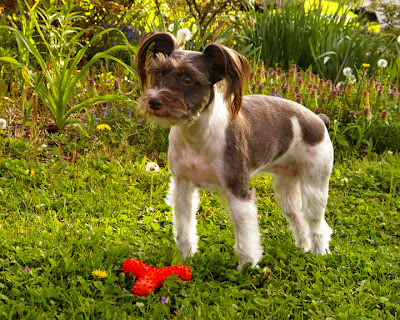 So, we must work to convince our lawmakers that natural is better, that all dogs deserve tails, and that no dogs deserve to be cosmetically altered by having their tails removed or their ears cropped. This must be about the dog's best interest and well being, not the human's "right" to do what they want to a helpless animal. As always, I'd love to get your feedback. Please let me know your thoughts on this post. Do you have a breed of dog that typically gets their tail docked, but their tail is whole? If so, I'd love to hear from you too. 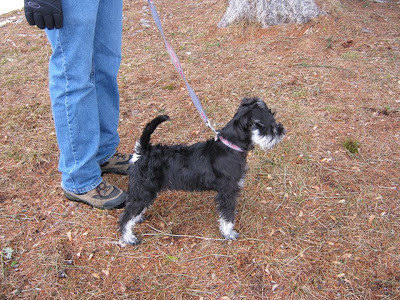 If you wish to see a certain docked tail breed highlighted on the blog, and you have photos of them with tails, contact me by either leaving a comment here, or visiting us on Facebook and Twitter. Remember always that EVERY DOG DESERVES A TAIL. It is not our right to dock them, it is our responsibility to ensure that they have a happy, healthy, pain-free life. Special thanks again go out to Jennifer Blazewick and her handsome miniature Schnauzer Louie, for sharing these wonderful photos of Louie and his amazing tail! 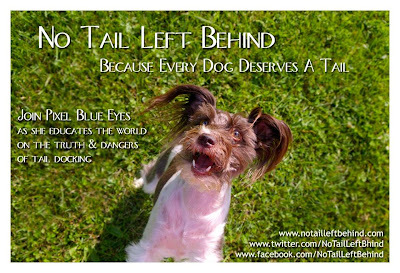 Thank you so much for shedding light on the horrors of tail docking. I feel that if they weren't meant to have tails or if their ears were meant to stand up, they would be born that way. Who are we to torture them to meet our aesthetic "breed standards?" I have a mini schnauzer named Louie with a tail too! We wouldn't have him any other way!